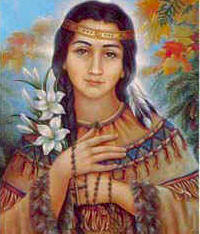 Kateri was born in 1656 near the town of Auriesville, New York, the daughter of a Mohawk warrior. She was baptized by Jesuit missionary Fr. Jacques de Lambertville on Easter of 1676 at the age of twenty. She devoted her life to prayer, penitential practices, and the care of the sick and aged in Caughnawaga near Montreal (where her relics are now enshrined). She incurred the hostility of her tribe because of her faith. She was devoted to the Eucharist, and to Jesus Crucified, and was called the "Lily of the Mohawks." She died in 1680 and was beatified June 22, 1980 — the first native American to be declared "Blessed." She was canonized on October 21, 2012. According to the 1962 Missal of St. John XXIII the Extraordinary Form of the Roman Rite, today is the feast of St. Bonaventure. His feast in the Ordinary Form of the Roman Rite is celebrated on July 15. 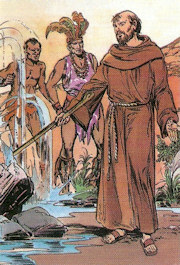 Historically it is also the feast of St. Francis Solano, Franciscan missionary in Lima, Peru. He was born in Andalusia, Spain, in 1549, and became a Franciscan in 1569. Francis labored for two decades in Spain and sailed to Peru in 1589. He worked until his death in Lima and elsewhere in South America. The blood of martyrs is the seed of saints. Nine years after the Jesuits Isaac Jogues and John de Brebeuf were tortured to death by Huron and Iroquois Native American nations, a baby girl was born near the place of their martyrdom, Auriesville, New York. She was to be the first person born in North America to be beatified. Her mother was a Christian Algonquin, taken captive by the Iroquois and given as wife to the chief of the Mohawk clan, the boldest and fiercest of the Five Nations. When she was four, Kateri lost her parents and little brother in a smallpox epidemic that left her disfigured and half blind. She was adopted by an uncle, who succeeded her father as chief. He hated the coming of the Blackrobes (missionaries), but could do nothing to them because a peace treaty with the French required their presence in villages with Christian captives. She was moved by the words of three Blackrobes who lodged with her uncle, but fear of him kept her from seeking instruction. She refused to marry a Mohawk man and at nineteen finally got the courage to take the step of converting. She was baptized with the name Kateri (Catherine) on Easter Sunday. Now she would be treated as a slave. Because she would not work on Sunday, she received no food that day. Her life in grace grew rapidly. She told a missionary that she often meditated on the great dignity of being baptized. She was powerfully moved by God's love for human beings and saw the dignity of each of her people. She was always in danger, for her conversion and holy life created great opposition. On the advice of a priest, she stole away one night and began a two-hundred-mile walking journey to a Christian Native American village at Sault St. Louis, near Montreal. For three years she grew in holiness under the direction of a priest and an older Iroquois woman, giving herself totally to God in long hours of prayer, in charity and in strenuous penance. At twenty three she took a vow of virginity, an unprecedented act for a Native American woman, whose future depended on being married. She found a place in the woods where she could pray an hour a day and was accused of meeting a man there! Her dedication to virginity was instinctive: She did not know about religious life for women until she visited Montreal. Inspired by this, she and two friends wanted to start a community, but the local priest dissuaded her. She humbly accepted an "ordinary" life. She practiced extremely severe fasting as penance for the conversion of her nation. She died the afternoon before Holy Thursday. Witnesses said that her emaciated face changed color and became like that of a healthy child. The lines of suffering, even the pockmarks, disappeared and the touch of a smile came upon her lips. She was beatified in 1980. Patron: Ecologists; ecology; environment; environmentalism; environmentalists; exiles; loss of parents; people in exile; people ridiculed for their piety; World Youth Day. Symbols: lily (a symbol of her purity); a cross (a symbol of her love of Jesus Christ); or a turtle (a symbol of her clan). This website is dedicated solely to information regarding Saint Kateri. Also this website, Lily of the Mohawk, is worth a visit. A wonderful place to make a pilgrimage is the National Shrine of the North American Martyrs. The Shrine is situated in the heartland of New York State, in the Diocese of Albany. The Shrine is the site of the America's first and only canonized Martyrs: St. Rene Goupil (1642), Jesuit brother; St. Isaac Jogues (1646), Jesuit priest; and St. John Lalande (1646), lay missioner. Here also is the birthplace of the Saint Kateri Tekakwitha, the Lily of the Mohawks, born at Ossernenon in 1656, just ten years after these Martyrdoms. Read more about St. Kateri in this article, The Lily and the Cross. For even more information you may order Kateri Tekakwitha: Mohawk Maid and/or Kateri Tekakwitha, Mystic of the Wilderness from Amazon.com. The diocese of Cordova, in Spain, was the birthplace of this Saint, who won many thousands of souls to God. From his earliest years he was characterized by a modest behavior, prudent silence, and edifying meekness. His education was entrusted to the Jesuit Fathers, and later he entered the Order of St. Francis. Soon he excelled every one in the house in humility, obedience, fervor in prayer, and self-denial. In 1589 he sailed for South America to preach the Gospel to the Indians in Peru. While near shore the ship struck rocks, and there was danger of drowning. The captain hurried the officers and principal passengers into the only boat there was, and tried to induce the missionary to accompany them; but he refused to do so. Consoling the remaining passengers, he prayed fervently and alone kept up his hope in God's mercy. At last rescuers arrived and all were taken off in safety. The missionary did not confine his ministry to Lima. He visited the forests and deserts inhabited by the Indians, and by degrees he won their trust and in this way baptized nine thousand Indians. He was then recalled to Lima, which at that time was like a godless Ninive. Francis preached to the hardened sinners, and the whole city became converted. Finally after a painful sickness his last words being, "God be praised!" his soul departed this earth on 14 July 1610. He was declared Blessed by Pope Clement X in 1675, and canonized by Pope Benedict XIII in 1726. Saint Francis' feast is held July 24th. Read more about this great missionary saint here.